When we bought our bus ticket from Mendoza to Valparaiso, Chile, we weren't just buying transit from one place to another, but also a spectacular bus tour through one of the great mountain ranges of the world. You know something is legitimately cool when even the locals are snapping photos of it. We started out with a mild spring day in Argentina and as we climbed up into the snowcapped Andes the temperature plummeted and the wind started to howl. We could now see how a storm forced us to turn back the day before: the narrow, spiraling mountain roads would be impossible with any inclement weather. 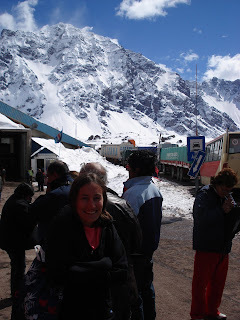 The Argentinian/Chilean border crossing is perched between peaks and we all loaded off the bus to go through customs. The other passengers thought it was pretty funny as Katrina hopped through the snow in her flip flops. Once in Chile we descended back down the Andes, through some beautiful valleys, and eventually arrived at our seaside destination. 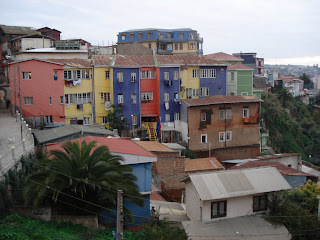 Valparaiso is a city built into the hills along the Pacific coast. The colorful houses dotting the landscape reminded us of Cinque Terre, but a much m ore urban, grimier version. We loved walking the cobblestone streets that twist along the hillside, but even more, riding the ascensores! 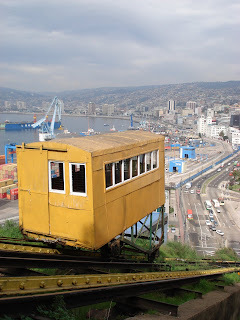 Valparaiso has used these funiculurs to transport people up and down since the late 1800s and the same cars are still in use today. Call it historical, thrilling, or nerve-racking to ride this rickety public transportation, they certainly make for great views and a whole lot of fun! Rather than neighborhoods the city is made up of a downtown area surrounded by cerros (or hills). Our favorite was Cerro Bellavista with its "open air museum" of brightly pa inted homes and one of poet Pablo Neruda's three houses. It costs $6 entry to go inside, but the fantastic views from the patio are free. Another popular cerro can be reached by the Artilleria ascensor, one of the tallest and oldest in the city. The Paseo de Mayo at the top is lovely but it turned a little seedy when we continued west. A nasty-looking barking dog finally convinced us to head back to the beaten path and work our way down the hill just along the ascensor track. Most accommodations in Valparaiso are smallish bed and breakfasts and hostels instead of big hotels. We found Casa Liesel on Cerro Concepcion surrounded by more expensive B&Bs, but just right for our budget at about $30 per night. We enjoyed a huge room, super comfy bed, and the best shower of our trip. The fact that all rooms share bathroom facilities was of very minimal bother since the most crowded it got during our stay was one other guest. In Argentina the standard dish offered everywhere was parillada: the mixed grill of various meats and sausages we scarfed down our first night there. In Ch ile, it's chorrillana. We went to the very hip and chill Mi Casa restaurant for dinner shortly after our arrival in Valparaiso where the waiter clued us in. What we got was something a 7-year-old kid might dream of putting together: chopped up hot dogs, steak, and cheese atop a huge pile of french fries. 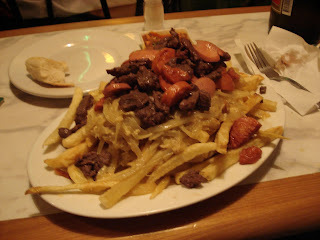 We washed this down with some beer the South American way-- a liter or two shared amongst friends. The brands changed from Skol in Brazil to Quilmes in Buenos Aires to Andes in Mendoza and to Escudo and Cristal in Chile, but the preferred liter serving size always stayed the same. We enjoyed a few liters of Escudo in good company the night of the Chile-Venezuela World Cup qualifying soccer match. In a dark, smoke room filled with plastic patio tables and chairs, we joined the reved-up fans in cheering on the national team. There was yelling, there was singing, and there was anger and disappointment when the game ended in a 2-2 tie. View more pictures from Valparaiso here.